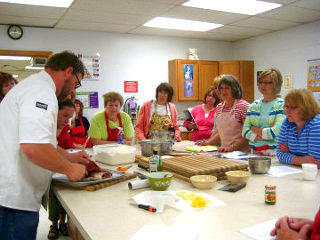 The last five years culinary night classes and workshops have been taught by chef Garth Clingingsmith through Dawson Community College. 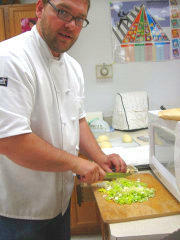 He has now accepted an offer to join a fellow chef and friend at his successful restaurant in Boston. The DCC's new administration is looking a culinary program with many exit points depending on the skills and the need in the MonDak region, from chefs for man camps to institutions and restaurants. Training may be as short as Serve-Safe for fast food workers to a one-year certificate program and a two-year associate degree in Culinary Arts. Culinary classes will train chefs to work with local growers and producers as well as gain skills in food preparation, safety, and food service management. Click here for a draft of the curriculum for the Prairie Academy of Culinary Arts Associate Degree at Dawson Community College. For Students—an excellent career choice, and hands-on learning from knowledgeable teachers with an interest in where your food is coming from. For Dawson Community College—adding full-time equivalent and new students to campus, offering a culinary arts degree at community college prices. For Restaurants and Food Services—a creative, resourceful workforce trained to prepare local and regional agricultural products, using more than boxed meats and and canned vegetables, and having problem solving skills to lead or manage. For Consumers—good healthy, delicious food focused on local products, which economically helps eastern Montana and eastern Montanans. The Associate of Culinary Arts degree will provide the initial education and training that a future food service worker needs to be productive at the mid-level in local food systems and food service outlets of any kind. The curriculum will combine a thorough academic component with a strong practical, hands-on, skills-based instruction appropriate for a well trained cook. build a strong base of knowledge in the field of food service and preparation and practical, skills-based exposure to the overall foodservice field (restaurants, institutional foodservice, catering, production and growing). prepare students for mid-level employment and management in any foodservice establishment. expose students to courses in computation, communications, and human relations, and will assist students in developing an understanding and appreciation for local food systems, nutrition and fresh, whole foods. provide students with opportunities for practical experience in the food service system via internships, working at our training facilities (both a commercial production kitchen and restaurant), and skills-based food theory and technique course offerings. serve those students seeking a career in foodservice by providing in-depth and practical skills-based exposure to the fresh, local foods that are eaten where they are produced.